Climate change has been a subject of much debate the past 10-30 years, sparking political discussions on what types of regulations are necessary. In the short term, it’s significantly more expensive to develop a greener infrastructure that moves away from relatively cheap energy sources like fossil fuels. Government subsidies are designed to encourage growth in renewable energy technologies. These subsidies allow companies working on renewable technologies to remain competitive with traditional energy companies, who control the majority of the market. They allow governments to help spark environmental change through private companies in an effort to help future generations, while limiting regulations or taxes on traditional energy sources. Solar power is a great example of a renewable technology that can disrupt the traditional energy market. Solar panels capture the sun’s energy and convert it to DC energy. The DC from the panel must be converted or boosted up to a higher voltage, which then is converted to AC through inverters. Once converted to AC, the electricity can be used by households, buildings, plants, etc., or sent directly to the electrical grid. For solar power to be a worthwhile investment, the solar panels must be extremely efficient in converting solar energy to usable electricity. To do this, companies have designed devices to help maximize the energy harvested by solar panels: solar power optimizers and microinverters. Solar power optimizers installed on each solar panel are used to condition DC energy before it’s sent to a central inverter for conversion to AC energy. Like solar power optimizers, microinverters are also placed on each solar panel, but they convert DC energy to AC energy directly on the solar panel. Although these technologies differ, they have the same goals: improve individual solar panel performance to help increase energy production by the entire system. What does this have to do with semiconductors? The smallest decisions in design and layout can impact the efficiency of both microinverters and solar power optimizers. One of these small but vastly important decisions revolves around the metal-oxide semiconductor field-effect transistor (MOSFET). See Figure 1. The solar power optimizer shown in Figure 1 shows the job of the MOSFET, which is to condition the voltage from the solar panel’s photovoltaic cells (PV+/PV-) before sending it to a central inverter (String+/String-) to finish the DC/AC conversion. These MOSFETs need to be able to reach high voltages during DC/DC conversions and thus need a gate driver because the FETs cannot be driven directly by a microcontroller. TI’s 120 V, 3.5 A, UCC27282 gate driver is a good fit for this situation. The 3-mm-by-3-mm gate driver was designed to drive two N-channel MOSFETs in high-side, low-side configurations. Since the MOSFETs are in an H-bridge configuration, the UCC27282 can quickly switch the corresponding gates, which are used to convert lower voltages to high voltages. Solar power optimizers also benefit from the safety features built into the UCC27282. Undervoltage lockout (UVLO) is a protection feature that inhibits each output until a sufficient supply voltage is available to turn on the external MOSFETs. The UCC27282 has a 5 V UVLO, the lowest of any current TI half-bridge gate drivers. This is helpful during startup when a sufficient voltage hasn’t been established and the DC supply voltage (VDD) doesn’t exceed the UVLO threshold. Without UVLO, a MOSFET can be turned on with an insufficient voltage that could damage the FET and the entire system. If the FET is not fully turned on, the device will have a high resistance during conduction and will dissipate the power as heat. Additionally, a MOSFET could be driven into an unknown state, where the FET may not switch when desired, resulting in a system not acting as anticipated. The UVLO for the UCC27282 is 5 V, the lowest of any current half-bridge gate drivers. Another advantage of 5 V UVLO is that it makes it possible to use a lower VDD, which helps increase efficiency because it decreases switching losses. 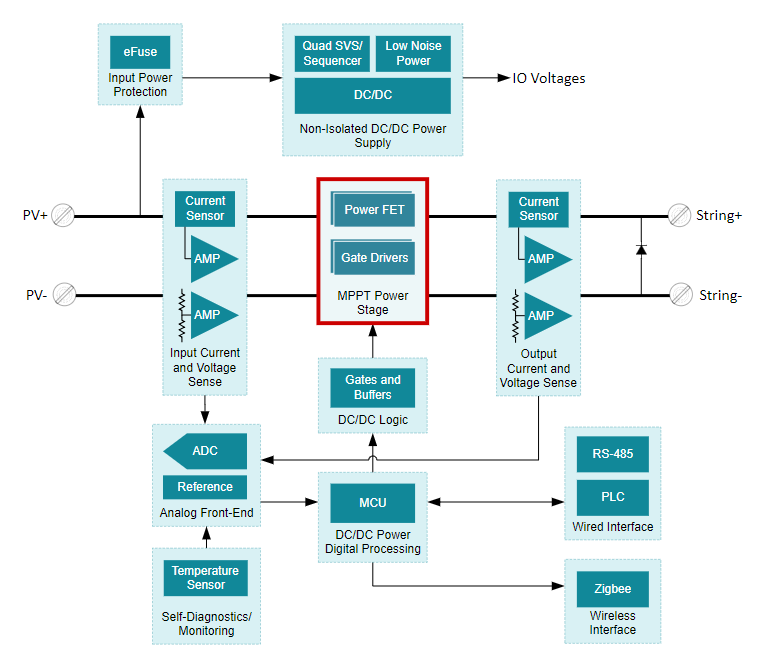 A lower VDD also enables more flexibility for optimizing total MOSFET losses. Because of the frequent switching of the MOSFETs in solar applications, switching noise can be felt on the input stage of the gate driver. If this occurs, the integrity of the input signal could be disrupted, causing two inputs to be high at the same time. The UCC27282’s input interlock, also known as cross-conduction protection, prevents this error at the inputs from being reflected at the outputs and causing damage to the power stage. A final performance feature that could help boost efficiency in solar power optimizers is an enable/disable pin. Power optimizers use maximum power point tracking for each individual module to ensure DC/DC conversion is performed in the ideal power-harvesting range. Once out of the ideal power-harvesting range, the UCC27282 is not needed for DC/DC conversion and its enable functionality can be used to reduce quiescent (standby) current losses. In the solar energy field, the smallest increases in efficiency are difficult to achieve. The slightest changes from some of the smallest devices in the design can make all the difference. While just a few percentage-point increases in efficiency may seem inconsequential, they’re necessary to gain market share from traditional fossil-fuel energy sources. Any gains made by renewable energy sources help create a cleaner society, which benefits future generations.